1917-P 25C Type 1 Standing Liberty Quarter Uncirculated Gem BU+ Full Head Rare! The 1917 Standing Liberty quarter is one of the classic type coin issues of the 20th century. The type design was only minted in two years, 1916 and 1917. The design was very beautiful, one of the most striking of any U.S. coin. However, Ms. Liberty's right breast was fully exposed and this caused quite an uproar at the time. In fact, the "Society for the Suppression of Vice" not only began to pressure the Treasury to stop minting this "immoral" coin, they also wanted the goverment to recall all the coins already in circulation (I'm not kidding!) The mint struck and released into circulation 55,230,000 coins before production of the Type I design was stopped midway through the year. The new design featured the upper torso of Ms. Liberty covered by medieval chain mail! The 1917 Type I quarter is rarer in circulated grades than the later date (1925-1930) Standing Liberty quarters, but mint state examples are readily available. Or are they? Here's an interesting story. In the early 1970s, Jim Ruddy and Dave Bowers were doing a project in which they were putting together complete sets of Choice Uncirculated 20th century type coins. They would later very successfully market quite a few sets. Even though this set also included the Barber half dollar, quarter, and dime, Jim Ruddy had told me at the time that he would buy any Choice Unc.Type I Standing Liberty quarter I could find for him, as it was the coin he was having the most trouble finding for the sets he was building. Most mint state Standing Liberty quarters have fully struck heads, something that cannot be said about the 1916. When PCGS first started , for the first few years we only designated "full head" on Type 2 Standing Liberty quarters as "all Type Is have full heads." But they don't all have full heads, especially the 1916, so we soon added the "full head" designation for Type Is also. Luster for Type Is can be satiny or frosty white. There are many examples with various degrees of toning. 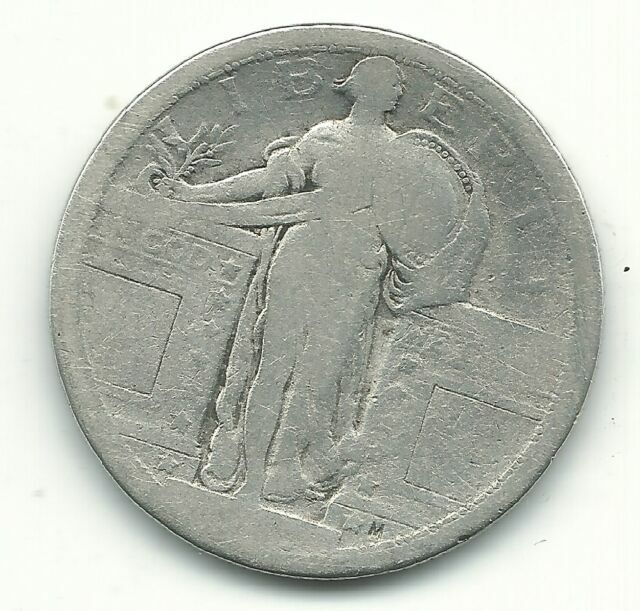 item 2 1917 P TYPE 1 STANDING LIBERTY QUARTER, VG/F, ORIGINAL SURFACES, PROBLEM FREE! -1917 P TYPE 1 STANDING LIBERTY QUARTER, VG/F, ORIGINAL SURFACES, PROBLEM FREE! Coin is ok but mediocre. True coin collectors prefer an original, untouched and unrestored specimen. This coin is none of these. The "shininess" may appeal to the novice collector, but not to me. I will keep it for my Type set, but stay on the lookout for a real, uncleaned original of this rare coin. The coin I got was the coin in the picture but it looks like it had been polished after the picture was taken. I didn't get a receipt either. I am not very happy with the coin though I will keep it instead of going through the hassle of trying to return it. Hard to truly see detail? Nice coin, but tough to buy from a picture! I am very pleased with this coin. I think it is one of my favorite coin.